Well, I made my gold and well exceeded the 100K mark. Actually did this about 3 days ago, but work has been a killer. 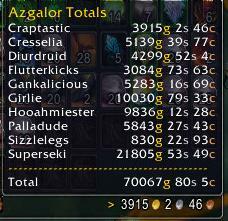 For you purists, this 100K does not count as it is split between horde and alliance but you know what? How did I do it? 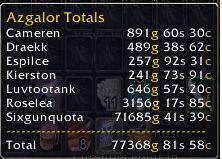 Farming herbs and ore of course, but I was able to transfer 9 Lunar Lanterns to the horde side of the AH and sell them for 12-20k each. Woot! Next year, you too can make a killing!